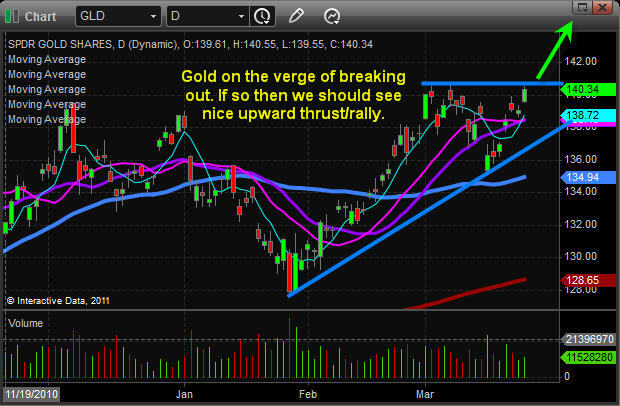 Another Do or Die Point for Equities and Gold – Get Ready! 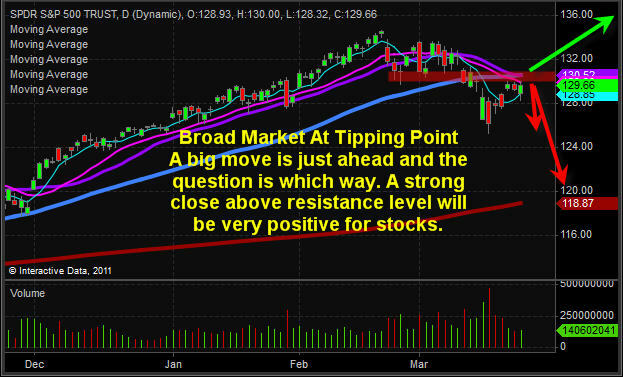 On March 13th I posted some of my analysis online showing how the market was trading at a key pivot point and that a sharp price movement was about to unfold. I also provided everyone with the direction in favor which played out perfectly catching a 4.5% in three days. As of today we are getting the same setup I saw over a week ago, but this time it’s pointing to higher prices. Take a quick look at the charts I was looking at for both the SP500 and gold and you will notice that they both moved to support levels before starting to bounce. While we caught the move down on the SP500 playing the SDS Double leveraged inverse fund we did not take part in falling gold prices. Reason being, there is so much fear in the market and the amount of surprise news popping up each week I don’t think shorting precious metals is a safe call. Rather I am looking for a pullback to cleanse the holders of the commodity then I will buy once price confirms the continuation pattern has completed. Now, stepping forward to this week’s price action. We can see in the chart below that price is currently testing a key resistance level. Before the week is over we could see some big price movement equities. I need to see what happens tomorrow but I have a feeling we could see a breakout to the upside for a long position. Gold stocks have been under performing the price of bullion for a few months but it looks as though they could be starting a sizable rally. If gold stocks continue to move sharply higher out of this pattern, then it’s a positive sign that gold and silver bullion will both continue to move up. Gold is testing a key resistance level and if it breaks above this pattern then expect much higher prices. I can see GLD moving up $5 from this level and gold futures moving up $60 per ounce fairly quickly.